My mother gave me this recipe for an easy no bake strawberry cheesecake. What makes it so easy? Have a look... ingredients that you can keep on hand in your fridge and pantry...one bowl...easy clean up. It doesn't get better than this. Try making this recipe for your next family get together and be prepared to receive rave reviews! Prepare whipped cream mix with 1/2 cup of milk. Blend in softened cream cheese, powdered sugar and vanilla. Pour into graham cracker crust. Chill in refrigerator for at least 4 hours. Garnish top with fresh strawberries or any can of your favorite fruit pie filling. 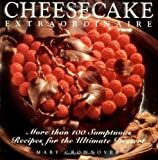 Add to your cookbook collection by visiting Amazon.com. If you enjoyed this recipe, then you'll want to sign up for my FREE ezine. You'll receive monthly updates on all things strawberry; recipe ideas, readers' comments, gift ideas, tips, trivia and more.